On Friday, September 27, 2013, hundreds of notable African Americans visited schools across the United States with the united goal to encourage students to COMMIT to excellence and their education. Participating HistoryMakers recounted their own school experiences and the struggles that they encountered on their paths to success. 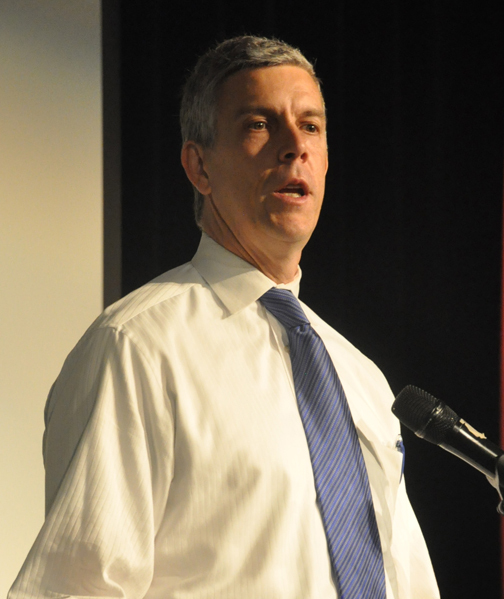 Secretary of Education Arne Duncan chaired the nationwide effort, with the goal of having almost 500 black leaders go “back to school” in 68 cities and 30 states. The program puts HistoryMakers in direct contact with over 25,000 students across the nation. Secretary of Education, Arne Duncan, along with Julieanna Richardson, founder and executive director of The HistoryMakers and Ernest Green, who was one of the Little Rock Nine, visited H.D. Woodson High School, on the northeastern side of Washington, D.C. The school is housed within a brand new building, with modern technology and resources, but still faces challenges such as a 40% truancy rate. The HistoryMakers’ Founder and Executive Director, Julieanna Richardson, is encouraging those within the African American community to give back. The HistoryMakers is donating subscriptions of The HistoryMakers Digital Archive (http://www.thehistorymakers.com/digital-archive) to participating schools. The digital archive includes extensive and easy-to-access interviews with life stories of over 600 HistoryMakers.